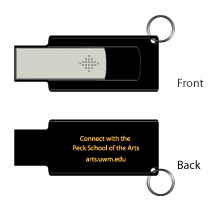 The UWM Peck School of the Arts put together a promotional video for prospective students. They wanted to use this video to help get students interested in the school during an open house. They originally planned on having the video pre-loaded on the flash drives. However when the flash drives were out of their price range, we suggested going with web keys as an alternative. At the open house, the web keys were a hit, and the school saw a sharp increase in the number of people watching their promotional video.